I love my new sewing space for a lot of reasons. 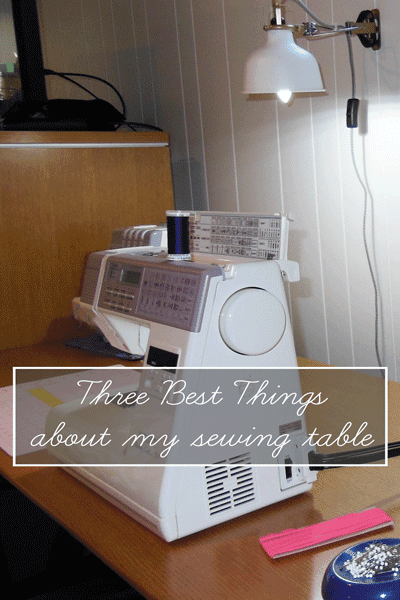 I love that the table is wide, allowing plenty of room for my serger and sewing machine. I love that all my tools and threads are right at hand. I love that I have a cutting-ironing-sewing work triangle. Today, however, I'm focusing on the sprinkles on the cupcake: the three best things about my sewing table that might not get enough priority when setting up a sewing space. 1. A mini trash can on top of the table. Sure, I keep a waste basket under the table, too. This tiny bin is not only cute, but so handy when clipping corners and trimming corners and seams. If I'm really doing a lot of trimming, I can even hold it on my lap so that it catches everything that comes loose. It's just much more handy than the waste basket, and I'm just that lazy. 2. A cutting mat beside my machines. Lazy, remember? My cutting table is right behind me, and I do all my large cutting there. 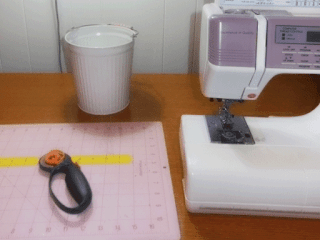 This small mat and rotary cutter are really helpful for small cuts, like squaring up a quilt piece and trimming off those "ears" that occur when sewing angled seams. 3. 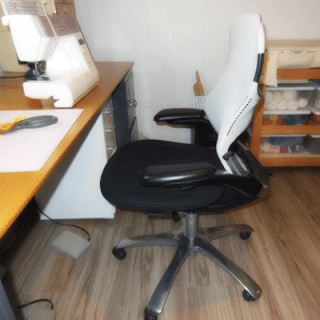 A chair with good back support. When I'm up and down frequently, which happens when you're sewing, I try to remember to take the time to sit properly in my chair. 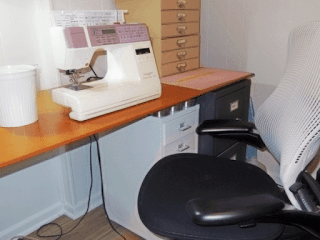 I also remember that the effort to sit properly and with good posture pay off by preventing back strain from a long day of sewing. Sitting properly in this chair makes the payoff even more consistent. This chair was made with ergonomics and comfort in mind throughout the design, and I love it. This particular chair is a Generation chair from Knoll. To be honest, it sells for much more than the other chairs I have at my desk and my craft desk. Now that I know what a difference it makes, I would definitely advise you to consider buying a really good chair, especially if you have back issues. Also, look how cute it is!